A vertical beam line extracted from the nuclear microprobe has been designed and is now dedicated to irradiation, especially in ion-by-ion mode. The beam from the Van de Graaff accelerator is deflected vertically, collimated by a capillary, and then extracted in the air through a 200 nm thick Si3N4 window. This minimizes the different contributions to geometric and energetic straggling, making it possible to use a few micrometers diameter microbeam with a well-defined energy. 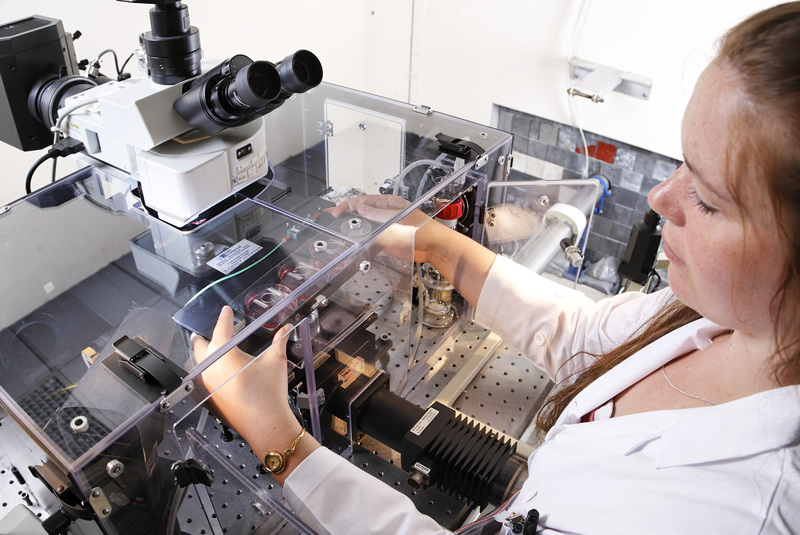 The irradiation facility is equipped with a fluorescence microscope to monitor in situ biochemical processes using markers. The device has been designed to be close to standard biological culture conditions; an incubator surrounds the irradiation board and can mimic physiological conditions. The irradiation culture wells are based on standard Petri dishes, and do not require any particular handling. It is therefore possible to envision long-term biological irradiation experiments. This device also allows to study fundamental radiological phenomena, such as the exploration of the spatio-temporal propagation of reactive species generated during the crossing of an energetic ion in a solution.